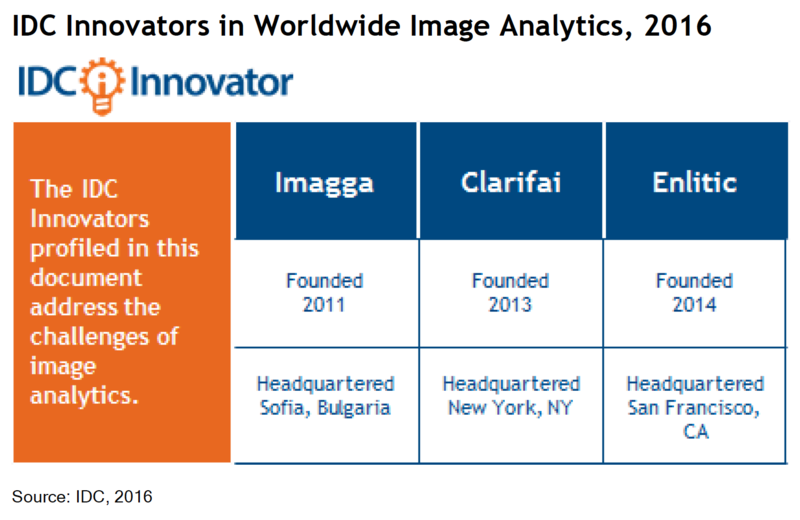 Imagga is recognized as one of the 3 pioneering players in the worldwide image analytics market. IDC’s 2016 Innovators report acknowledges companies that offer an inventive technology and/or groundbreaking new business model. Imagga stands out with the possibility to offer custom image recognition training using custom-provided data for training sets, according to the prestigious report. Thanks to the flexible training model, customers are offered unprecedented opportunity to make sense of their image content and use the insights for analytics, understanding customers or better monetization strategies. Depending on the complexity of the training model, it takes form a day to couple of days for the actual training. Customers are given visual tools to evaluate the results and decide if fine-tinning is needed for greater performance. According to Carrie Solinger, senior research analyst at Cognitive Systems and Content Analytics “Application of natural language processing and machine learning technologies have advanced image analytics’ cost effectiveness and accuracy, exponentially”. Services as Imagga enable business to harness the power of machine learning and do what once was done manually with great expense of manpower, or was impossible due to time restrictions. Real time (or near real time) image analytics opens up totally new horizon for companies to optimize their business decisions with direct effect on productivity and business results. You can download this report from IDC here.